And a good, good day to everyone, wherever you are. This has been a very busy week in the garden for the DH and your Aunty. 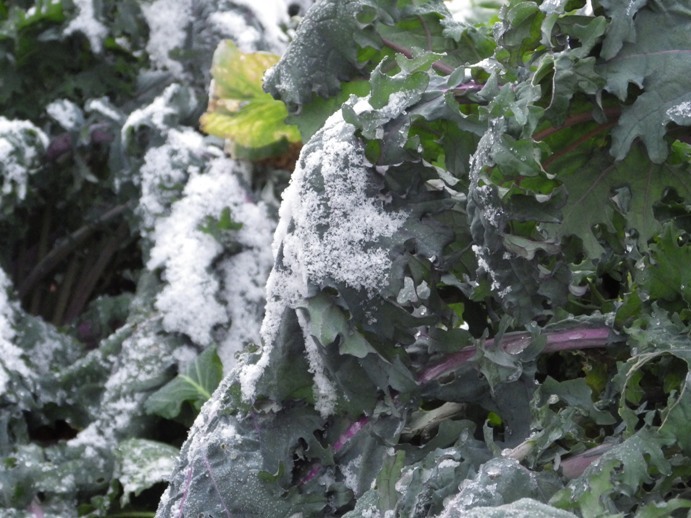 Not for choice necessarily, but sometimes you have to get things done before the weather gets colder, or rainier or something else (yes, what is on that kale is SNOW – it was 27 degrees F this morning. 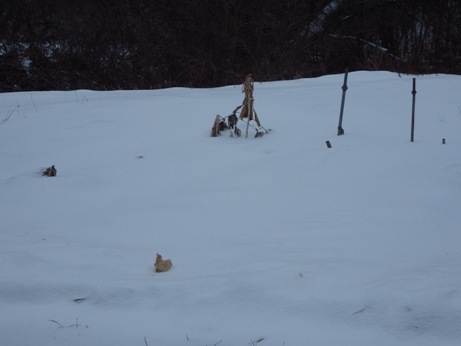 I think we can safely say that winter is coming). The big job that had to be taken care of was the arrival of the replacement fruit trees. Yes. Replacement. Not addition. Replacement, as in ‘Dear Sir, the fruit trees x.y.z etc. that I ordered from you did not grow. As a matter of fact, they died. Toes up. Kicked the bucket. Gone to meet their maker. Please send replacements. Respectfully…” It happens, and if you don’t know this first thing in the spring (which most people don’t because you are waiting, hopefully, that the damned things will leaf out and oh, joy!! 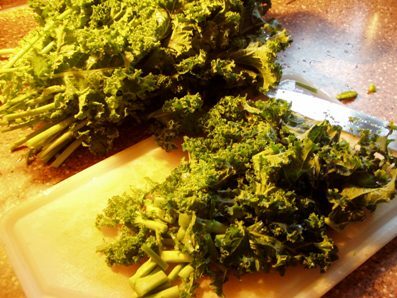 Confession Time: Aunt Toby has tried…Lord knows I have tried… to like kale. 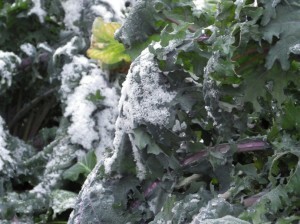 Kale is one of those veggies that everyone writes glowingly about. It’s great stuff, full of B-everything, anti-inflammatory as all get out. Everyone should eat a boat-load and so on.